When the muscles that connect your jaws don’t function as they should, you may have a condition known as temporomandibular joint disorder. Patients with TMD often find themselves clenching their jaws or grinding their teeth, which causes jaw and facial pain and wearing down of dental enamel. TMJ problems are common among dental patients (many people grind their teeth at night ), but these issues can be alleviated and prevented with a series of oral health therapies. If you’re suffering from TMJ problems and pain, our Glen Ellyn TMJ dentist, Dr. Daniel DeLeon, offers treatments that can help. What are TMJ Disorder Symptoms? TMJ patients typically show a great deal of wear on teeth, which end up looking flatter over time. It’s even occasionally possible to see notching of the teeth at the gum line where teeth flex during night time grinding. Many of these symptoms call for restorative dental care and other oral health therapies to reduce pain and prevent damage to teeth. Procedures can include massage for sore joints or anti-anxiety treatment to prevent stress-related triggers. Teeth that have been worn down due to night-time grinding may need porcelain crowns or veneers to renew their appearance and durability. Dr. DeLeon’s Glen Ellyn dental office offers a number of therapies to effectively treat patients with TMJ dysfunction. How can you get Relief from TMD Pain? For patients with TMJ problems, their first concern is getting out of the pain that comes with this condition. Night time teeth-grinding and involuntary jaw clenching leaves face and neck muscles sore throughout the day, and can even trigger migraines or cause headaches. Traditional night guards: This is a full-arch, horseshoe-shaped appliance with gel material on the inside. These night guards fit comfortably protect your teeth at night and keep your jaw in a healthy, well-aligned position. NTI appliances: As opposed to traditional mouth guards, these are not full-arch mouthpieces. 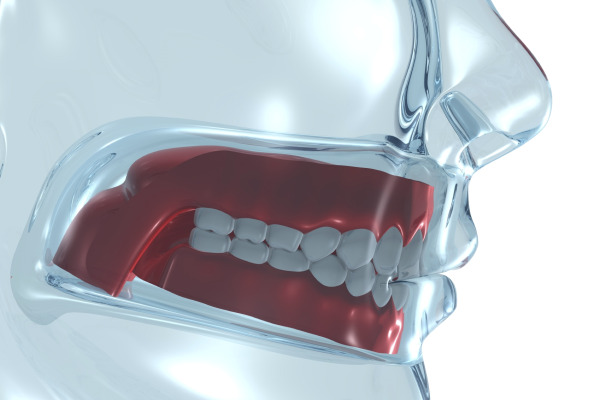 Rather, they are custom-molded acrylic appliances that attach to your lower front teeth. The NTI appliance is perfect for patients who feel that a traditional mouth guard is too bulky. This TMJ oral appliance prevents back teeth from touching and therefore prevents muscle tenseness, which causes TMD symptoms – it’s also FDA approved to provide migraine headache relief. Suffering from TMD Symptoms? We Can Help! Our goal is to help patients get out of pain and enjoy improved oral health. If you’ve been dealing with uncomfortable symptoms of TMJ disorder, our Glen Ellyn TMJ dentist can help. Call our office to learn more about night guards and other oral appliances for TMJ pain relief.